Last Fri, S&P500 logged its largest one day fall since 3 Jan 2019, due in part to the weak European PMI and the yield curve inversion between U.S. 3-month bill and 10-year note yields. At the time of writing this, Dow closed 0.55% higher on Tues as U.S. 10 year bond yields stabilise. Is last Fri’s fall the precursor to something more serious? Or it is a false alarm? First things first, what are the reasons for the sharp rally since late Dec? e) Equity market valuations have become more palatable after the sell-off in Dec 2018.
e) In the coming weeks, we shall know how U.S. corporates fare in 1QFY19F and their guidance for 2Q. Samsung Electronics just warned on Tuesday that 1QFY19 financial results will be lower than market estimates. This is unlikely to be an isolated case due to the slowdown in Europe, China, business cycle etc. h) U.S. reached its debt ceiling on 2 Mar 2019. Through extraordinary measures by the Treasury Department, U.S. is prevented from breaching its debt ceiling until late Sep or early Oct. 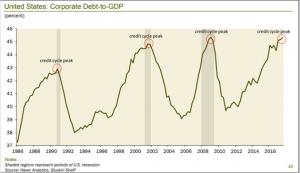 This issue will likely rear its ugly head in the next few months as we head towards Sep / Oct.
i) Corporate debt –> Much has been written on U.S. corporate debt especially when U.S. economy is slowing down amid the global economic slowdown. A most telling chart can be seen in Chart 1 below. 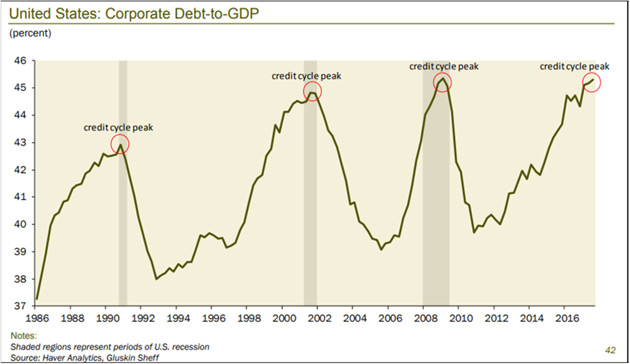 U.S. corporate debt has reached levels near prior peaks which preceded market falls. 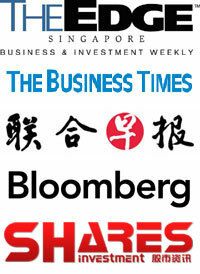 This phenomenon is not only seen in the U.S. Based on a Bloomberg article dated 26 Mar 2019, Singapore’s top law firm Rajah & Tann Singapore LLP mentioned that weaker companies may find it challenging to refinance their debt amid a slowing Chinese economy and heightened risk aversion among alternative capital providers. Based on Bloomberg compiled data, Southeast Asian companies have maturing debt obligations amounting to US$17.9b in 2019 and this will swell to US$23.2b in 2023.
k) “Speculative frenzy” in some parts of the market which may render them highly vulnerable to sudden market falls. For example, China markets have soared almost 22% from 3 Jan 2019 through 26 Mar 2019. 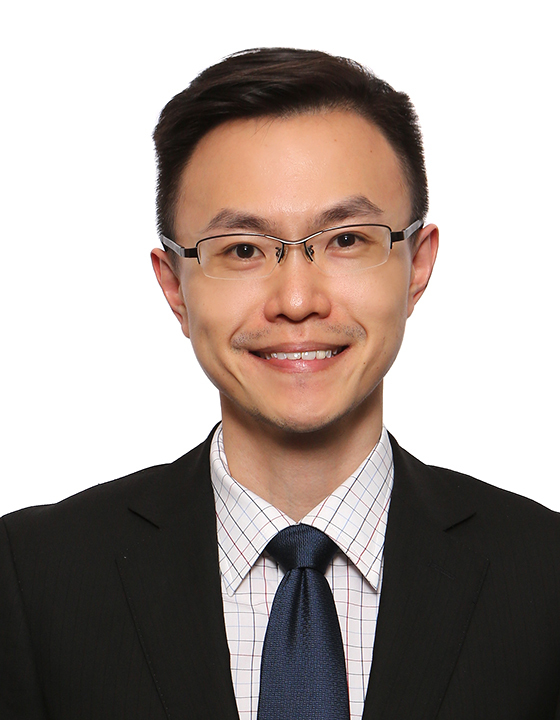 Based on a Bloomberg article dated 22 Mar 2019, Shanghai-based Foresight Fund, managed by Chen Guangming secures US$10b in funding in 10 hours for his fund (This seems to be a case in point for speculative frenzy). Closer to home, some Singapore small mid cap stocks have rallied in the region of 30-60% post their results last month far above analysts’ target prices. Based on Chart 2 below, S&P500 has broken the the long-term uptrend line established since Feb 2016. However, it has breached the short-term downtrend line established since Oct 2018 on 15 Jan 2019. S&P500 has touched a 5 month high since Oct 2018 on 21 Mar 2019 and closed at 2,818 on 26 Mar 2019, up 20.1% since the low on 26 Dec 2018. ADX closed around 20.1 on 26 Mar 2019 amid positively placed DI. RSI closed at 57.5 on 26 Mar 2019. All indicators especially OBV, MACD and MFI showed clear bearish divergence on 25 Feb 2019 and 21 Mar 2019 (the two recent peaks). [RSI showed mild bearish divergence]. Although the exponential moving averages (“EMAs”) are still rising (i.e. Trend is up), the bearish divergences showed by the multiple indicators may indicate that the recent up-move is not sustainable. Based on Chart 3 below, STI has jumped 215 points, or 7.2% from the intra-day low of 2,993 on 4 Jan 2019 to trade 3,208 today. In fact, STI has touched an intra-day high 3,286 on 20 Feb 2019 before profit taking set in. ADX last trades 10.5 on 26 Mar 2019 amid negatively placed Dis. Short term EMAs such as 20D and 50D are falling with 200D EMA flat. RSI last trades 48.7 on 27 Mar 2019 after touching a recent high of 68.1 on 20 Feb 2019. It is noteworthy that unlike Hang Seng and S&P500, STI did not touch a multi-month high this month. This may be because STI may have peaked earlier last month. There is a confluence of support 3,183 – 3,188, followed by a more critical support region 3,150 – 3,158. We will only know whether STI may have peaked in Feb if it stages a sustained break below 3,150 – 3,158 with volume expansion. A sustained break below 3,150 may open STI to more downside. c) There are some market watchers who point out that although the economy is experiencing a slowdown, the economy is not that weak. In fact, some say that the economy may have already bottomed etc etc. Notwithstanding the plethora of information and data points which we need to take note, in my opinion, I am paying special attention to the following two drivers, namely 1QFY19 corporate results & their upcoming guidance and price action on the indices. Firstly, we should start to have a sense of U.S. 1QFY19 corporate results in the next few weeks. Furthermore, it is imperative to see how the U.S. corporates guide for their 2Q results so as to gauge the probability of an earnings recession. Recall in my 23 Dec 2018 write-up (click HERE), I mentioned most strategists believe that the bull market is likely to end when three conditions occur, namely inverted yield curve, earnings recession and economic recession. Secondly, I will see how the indices’ chart pan out in the next few weeks. i.e. Whether they breach recent highs, or they break important supports may provide important clues to formulate future action plans. In view of the above, I am generally cautious on the equity market with a view that volatility may return in the next couple of months. I am only 5% invested but remain ready for trading opportunities, especially if markets overshoot either on the upside or downside. I have generated a list of stocks sorted by total potential return using Bloomberg data as of 25 Mar 2019 for my clients and have sent the full compilation to them two days ago. For the benefit of my readers, I have summarised the Top 10 stocks by total potential return in Table 1 and the last 10 stocks by total potential return in Table 2. Amara, Yoma and OUE rank as top 3 stocks sorted by total potential return. UMS, Cosco and Hi-P rank the lowest in terms of total potential return. Please refer to the tables and the important notes below. 1. This compilation is just a first level stock screening, sorted purely by my simple criteria above. It does not necessary mean that Amara is definitely better than Genting Singapore or UOB bank in terms of stock selection. Naturally, my market outlook and trading plan are subject to change as charts develop. My plan will likely not be suitable to most people as everybody is different. Do note that as I am a full time remisier, I can change my trading plan fast to capitalize on the markets’ movements (I am not the buy and hold kind). Furthermore, I wish to emphasise that I do not know whether markets will definitely rebound or continue to drop. However, I am acting according to my plans. In other words, my market outlook; portfolio management; actual actions are in-line with one other. Notwithstanding this, everybody is different hence readers / clients should exercise their independent judgement and carefully consider their percentage invested, returns expectation, risk profile, current market developments, personal market outlook etc. and make their own independent decisions. ADX, Amara, analyst, bear, bearish, ceiling, Chair, chart, China, corporate, Cosco, curve, data, day, debt, Democrat, divergence, dividend, dovish, down, earning, ECB, economic, economy, Electronic, Ernest, fall, Fed, GDP, Genting, Hi-P, indices, invert, Jerome, largest, Lim, low, Mueller, OUE, Performance, place, positive, Powell, price, recession, remisier, Republican, resistance, return, risk, RSI, Russia, S&P, S&P500, Samsung, share, Singapore, slow, stock, support, target, tension, trade, Trump, U.S, UMS, UOB, volatile, volatility, yield, Yoma permalink.